Way back in the 1800s, man’s greatest fear was being buried alive. Medical science wasn’t as evolved as it is today, so the ignorant masses were afraid that when they took an afternoon siesta after a particularly large tankard of ale and gruel, their overeager relatives would see this as a chance to get their mitts on all their worldly possessions (lice-infested cloak, rusty shovel, and empty tankard – stuff like that no doubt), proclaim the unfortunate chap dead and have the little bugger all buried just before he wakes up wondering why the devil his mouth is full of dirt and maggots are trying to move in on his soft parts. Living in a futuristic society as we do now, we don’t have to worry about such primitive situations and instead have to contend with money-grubbing doctors leaving their cell phones in our guts during operations because they’re too busy discussing their golf game with the stacked nurse and foreign anesthesiologist. Thank God for progress. 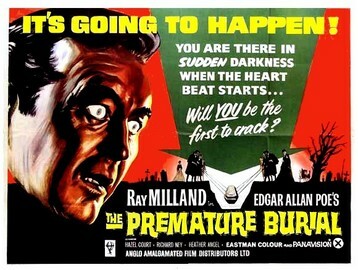 The Premature Burial unsurprisingly plays on this fear of being buried alive prematurely, but more importantly than that, it plays on the fear of a Roger Corman film based on a Edgar Allan Poe work without Vincent Price. Do to some dastardly business dealings, Corman went to a company other than American International Pictures to make this movie, but Price was under contract to AIP so Corman had to settle for Oscar-winning actor Ray Milland (Frogs) instead. Due to some further dastardly business dealings and in one of those ironic twists usually reserved for movies like this, the movie ended up at AIP anyway! Don’t worry about Corman and Price’s relationship though – they would team up for four more pictures the following year alone! And poor Ray Milland? He would work again with Corman as well in X – The Man With The X-Ray Eyes, though I’m pretty sure he wished it had been The Man With Plugged Up Ears since one of his co-stars was that annoying hockey puck, Don Rickles. Everything else about the movie is pretty standard issue for these sorts of things. Big ancestral home located on the fog shrouded moors, hot young wife who can’t understand why hubby’s nuts, stud doctor who hangs around hoping to nail hot young wife once hubby goes completely bonkers, pets that get themselves into jams that foretell our hero’s own fate – all the good stuff is here. Milland is a guy by the name of Guy and he finally consents to marry his sweetheart Emily after being very reluctant due to his fear of being buried alive. Guy developed this obsession because he’s convinced that his own father was buried before his time due to his catalepsy. I looked up catalepsy since there was no way I could figure out how a guy could be buried alive just because he had fits where he flopped around on the floor meowing, but it turns out that catalepsy is a condition where a dude goes into a trance-like state with no reaction to outside stimuli. That was my second guess. Guy’s obsession really kicks into high gear when he attends a grave-robbing his father-in-law is holding to get bodies for his medical research and it appears that the guy in the coffin had tried to get out after being buried! Guy knows there’s only one way to avoid a similar fate and that’s to build the most advanced mausoleum the world has ever known! This is the best part of the movie and veers into parody as Guy gives his wife and Dr. Stud a tour of all his failsafes and backup systems he’s built into it. Collapsible coffin? Check. Loud bell? Check. Secret door? Check. Rope ladder to roof? Check. Food and reading material until someone comes and lets him out? Check. Wet bar? Check. Dynamite to blow the whole business if all the secret and trap doors stick? Check. Poison just in case everything else fails? Check. Obsessive compulsive dude who needs a day job? Double check! With all that in place, what could possibly go wrong? A nagging wife of course! Emily threatens to leave him unless he gets rid of his pet mausoleum. Guy reluctantly complies and is seemingly cured of his affliction, at least until his pet cat is discovered trapped in the walls of his house! Strictly average in scope and execution, The Premature Burial feels like it was made to play on a double bill at the drive-in, so you’re lucky that you also get the Corman-Poe-Price The Masque Of The Red Death on the same MGM Midnite Movies DVD as well. The only impression this movie really left with me one way or the other was that all of this would have been avoided if Guy just convinced his relatives to leave him lying off in some room for about a week after his apparent death and checked him every so often to see if he re-animated himself. This film should induce only mild catalepsy in modern viewers.